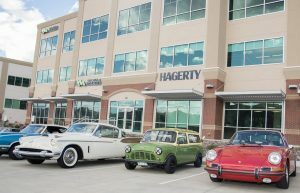 Hagerty collector car insurance in Golden is supporting Auto-Archives by donating the Coffee and Donuts that are available at some Hagerty events for a small donation. The proceeds from the coffee and donut sales go directly to the Archive. Our ‘Goodwood in Golden’ event was held at the Hagerty office in September and with Hagerty covering the cost of the food and drink, we managed to raise over $2500. Several Hagerty employees are currently donating volunteer hours through the Hagerty Community Service program and have also made donations of magazines as well as some USA License Plates for our ’50’ State collection. Thank you to everyone at Hagerty.